So you have all this beautiful, rich, and flavorful veggie broth now. Here’s a perfect fall recipe to use it in! I don’t know about you, but squash has been piling up on my counter. It’s beautiful, sure, but it’s not there for decoration. I was getting more and more squash every week in my veggie box, and I think it was starting to taunt me. So what do you do to things that taunt you? You turn them into bisque! And actually, in all seriousness, this is the best squash soup I have ever made. Ever. And it’s all thanks to my homemade veggie broth. I knew the broth was nice when I made it, but I had no idea how much it would actually improve the favor of the things I made with it. 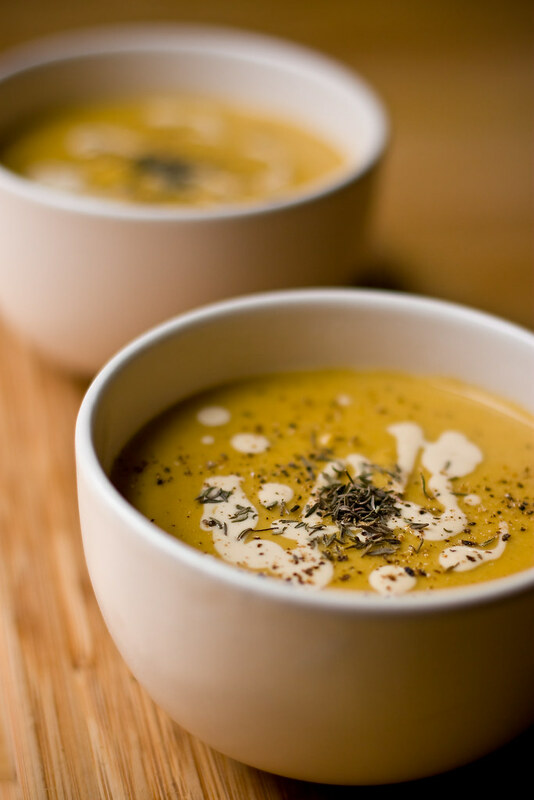 I made this with my favorite squash, delicata squash. Delicata is an heirloom squash that I first tried when I joined a CSA. Since it’s an heirloom veggie, it’s grown for flavor and not for mass-shipping; the thin skin of this squash made it harder to transport thousands of miles from where it was grown. Consequently it has been largely ignored for the last 75 years or so. It’s gaining popularity now, so you have a good chance of finding it at your local store or farmers market. And man this is a lovely bisque. This is rich, full-bodied, yet very, very simple. 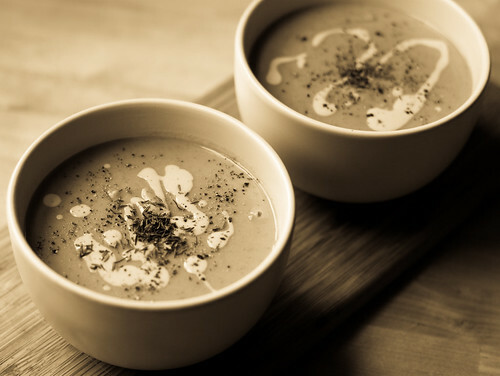 So simple you won’t believe how such an easy soup can taste so wonderful. I use a cashew cream (one of my favorite tricks) to give this soup a velvety rich texture and creamy flavor that won’t disappoint. Start with a high-quality vegetable broth and this will be your favorite soup of the season. Peel squash and chop off the ends. Halve the squash and scrape out the seeds. Place on a baking sheet cut-side down and brush lightly with oil. Bake for 30-40 minutes until tender and beginning to brown. Flip squash before the baking is finished if needed to prevent burning. Remove soup to bowls (or mugs!) and garnish with extra cashew cream drizzled on the top and some fresh black pepper. Little squigglies of cream look nice, but you can also draw hearts or stars or swirls, whatever! October 19, 2010 - 2:15 pm Pingback: october roundup « Awesome. Vegan. Rad. Does this bisque freeze well? 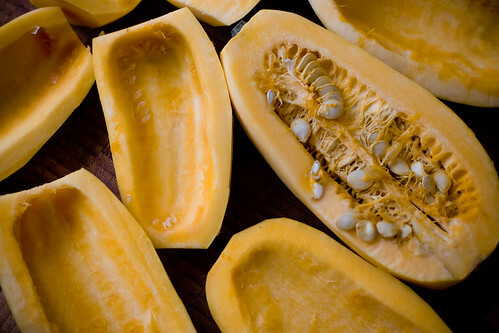 It sounds amazing, but I’m the only squash eater in my family….